If there’s one thing every superhero is going to have to deal with sooner or later, it’s battling their evil double. That’s a fact. For Faith however, those #superheroproblems take on an interesting new slant as she is brought face to face with… well… herself. But with a thief on the run with some valuable and potentially very dangerous items, she’s going to have to deal with this problem quickly if she hopes to save the day yet again. Houser’s decision to set this latest two-part adventure in a sprawling Comic Con is absolutely inspired, and her “Con Tips” continue to enhance the narrative with their wry double meanings. The geek culture references are brilliantly timed as usual, and the fact that Archer is still dressed as Legolas offers up a swoon-worthy moment that’s too good to miss. The story zips along at a brisk pace, but manages to never feel rushed as the storyline and comedy beats are all allowed to land before we’re quickly whisked along to the next one. Pacing in comics can be a tricky beast, but it seems to be one that Houser has tamed with consummate ease here. I stand by my previous statement that I’d be perfectly happy if Marguerite Sauvage drew every single comic on the shelves these days. Thriller? Espionage drama? Horror? Everything is guaranteed to look better in Sauvage’s gorgeously soft, wonderfully expressive style. That’s not to short-change Pere Perez in the slightest, as his detailed, dynamic work gives the story its engine as Faith, Faith and Archer try to track down their elusive thief. My only minor criticism is that Andrew Dalhouse’s colours occasionally feel a little flat, giving the proceedings a slightly sterile, overly digital aesthetic. This is just minor niggle though in an otherwise gorgeous looking comic, however, with Perez’s inventive, intuitive layouts in particularly being worthy of additional praise. Mixed in with the usual uplifting comedy is some genuine emotional heft, with one absolutely fantastic moment of heroism and one quiet (yet no less moving) exchange on the final page. And that right there is pretty much the main selling point of Faith as a character, for me at least. Yes, she’s funny. Yes, she’s almost relentlessly positive. But the fact is that it’s almost impossible not to find yourself caring about the character. She’s so damn likeable and so damn relatable that – as cheesy as it sounds – it sometimes feels like you’re right there with her as she struggles her way through these daunting, seemingly impossible situations. Easily the best issue of the series so far, and featuring perhaps my favourite Faith moment of all time, this is pretty much essential reading. 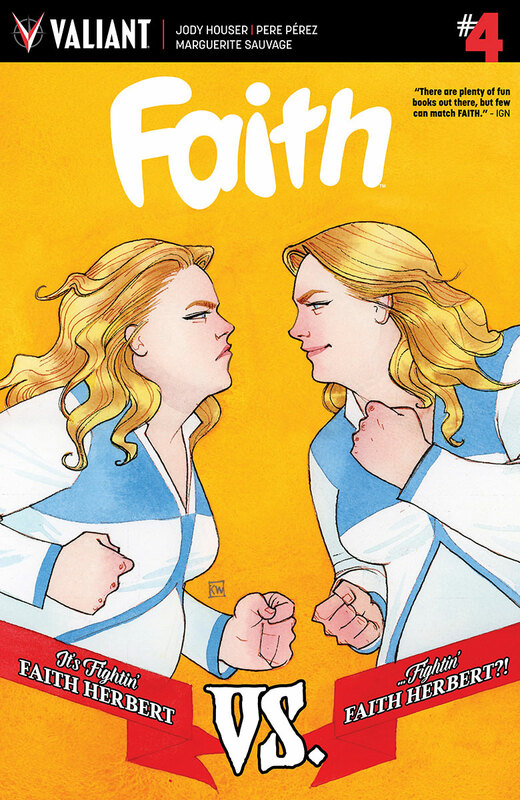 I absolutely love Faith, and if you pick this comic up I guarantee you will too.